As world renowned manufacturers of pewter giftware, English Pewter Company always strive to design and produce original and stylish new items to offer our customers. That is exactly what we have done with our collection of elegant pewter flask and leather pouch sets. 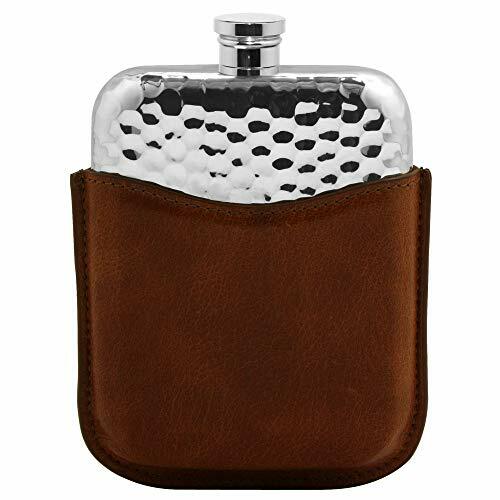 This 6oz Hammered Purse Flask & Pouch couples a sleek and chic 6 ounce flask with a handsome tan leather pouch to keep the flask safe and add an extra dimension to the stylish nature of the overall package. A great gift to mark any special occasion, the PLF03 measures 5.1" by 3.5" and is supplied complete with an attractive cream and black presentation box adorned by the English Pewter Company logo.